I'm such a newb again, but neither CKO or CAO have 0.23 up yet. Do we just have to hold tight until they release them before editing our rc files? CKO definitely has 0.23 up (listed as “beta”). +1 for "0.23 and Me"
Yeah, I’m liking that one too. I was also trying to fit together something referencing the new Confusing Touch, but couldn’t come up with anything. I think I'm going to go ahead with "0.23 and Me", given the delightful synchronicity. Edit: Assuming periods are permitted in the name, which may not be true. You could try either a , or a · if a . doesn't work. Yeah, maybe a . won't work... could always try "v23 and Me"
Clan names must contain only alphanumeric characters, underscores, and hyphens. Underscores will be converted into spaces. Once a player's username is in the captain's rcfile and the captain's username is in the player's rcfile and the tourney scripts notice this, the players will be in the same clan. The tourney scripts check for updates to rcfiles once every four hours. I want to say "Yay!" and "Ouch!" at the same time. Youch? Is Minotaur Berserker still the generally accepted easy mode? Thanks. It's been ... a while. I think I need easy mode to start. First loss! Due to Hubris Maximus! Most excellent! I shouldn't be far behind you. I'm planning to start a run (and likely die) tonight. Dammit. I got greedy. I scored the Ascetic II banner (no potions/scrolls used by the end of Lair) and was cruising along easily, so I went for Ascetic III (get a rune with no potions/scrolls used) which comes with a bonus 50 tourney points. I made it to Snake:4, heading in to the main vault, when I got Nikola'd. Who would have thought, indeed? Gosh, I forgot how much fun this game is! My first character is still alive and kicking. I've gone with the tried and true MiBe of Trog, and he's lumbering his way through the core levels. At the moment he's cleared Level 10, and found the Lair. I came soooooo close to dying against some stupid orc with +2 plate armour, but other than that things have gone mostly smoothly. Well, outside of falling through a hole in the floor three levels down and running into Erolcha and a half dozen other nasties at the bottom. Beserking got me through that fairly well, which surprised me. Mainly I'm just trying to hit things with the best weapon I have at hand, and call upon Trog to help me out if things look dicey. I've forgotten a lot of the handy keystrokes for speeding up gameplay, but they are starting to slowly come back. I'll probably head to the Lair tomorrow when I pick up playing again. Woah, dude. Wha'cha do? 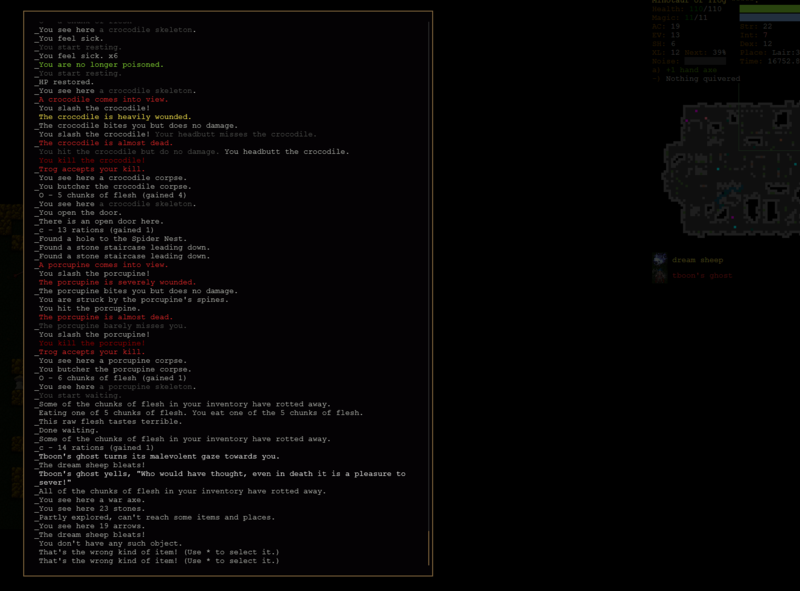 A bit too quick to the PC to play DCSS, I wager. Congrats merphle. I forgot how hard this game is. I may need to start up a Minotaur to build my confidence back up again. That, and remember to pause and *think* before I get myself needlessly killed. regeneration and random teleport to nearby enemies made it nearly impossible. Surprised I made it back to the Depths. My character was pretty stout, I cruised through V:5 for my third rune so decided to get the Abyssal because my last couple of times through there were pretty easy (as long as you have a lot of teleportation scrolls you can always get out of trouble, assuming you can actually read them). Got to Abyss:4, was not having a bad time of it at all but had a situation where I decided to teleport since there were a lot of enemies on the screen. My teleportation took me right on top of the rune (which I did not realize until later) but stuck between undiggable walls all around except for the tiles SW and SE. Also in the rune chamber were two orange crystal statues each surrounded by deep water. So, I started to fight my way out with all the statue spam around me. When I was a couple of tiles from where I had come in, I realized the rune was where I had teleported in. So, I decided to go back and get it. Somewhere, I got brain fed into negative Int, so when things started to go very badly I could not read a scroll to teleport out of there. I tried to fight my way out but was swarmed by summons. - realize where you are part 2 - one orange crystal statue is not joke, two are super scary, if you see that get out immediately! I could have found the rune somewhere else or just bailed. Kind of disappointed in myself, I should know better by now. But obviously not. All hail Hubris Maximus! Thanks. My first ever sub-3 hour win, netting me the Speed Demon III banner. I also nearly succumbed to -Int in that game. There was an Orange Crystal Statue with some Crystal Golems guarding a runed vault. After multiple hit-and-run attempts, I finally killed everything, then went to check out the artifact ring they were guarding. I tried to swap it with one of my existing rings, and was informed something to the effect "that would make you go brain dead". Then I realized that sometime during that fight my Int dropped to 1, and it was only 1 because the ring I was trying to swap off happened to have +3 Int on it. Anyway... rough games, Rouc and tboon. It was painful to read your synopses. Nothing worse that being unable to finish the game with the rune of Zot in your back pocket. I've been there a few times. My goals for this tourney: MiBe, DDFi, and GrGl wins. Then do a 15-runer again. I played a lot of the PC version of Rogue back in '87-'89 and had a blast. A group of us at college took turns playing it. 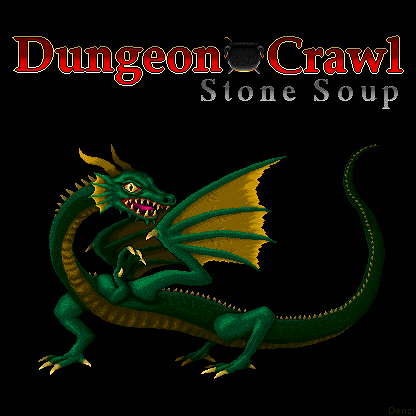 I'd heard the phrase :Dungeon Crawl: Stone Soup" before, but never searched to see what it was. After seeing this thread, I had to sub just to feel like I was learning a new language for free. I don't understand what half things you guys say are, but it sure sounds cool. I've now watched a couple runs on the Tubes. Pretty cool game. I'll cheer you guys on to whatever it is you're trying to accomplish. And yeah, -22 Intelligence is maybe the lowest I've ever seen, tboon. That's an impressive achievement in itself! That's like my typical day at work in real life. I'm still lumbering along with my minotaur. I just hit XL14 and have cleared the Lair. I had a couple of close calls that Trog saved me from. I really wish he'd give me a nice big axe to chop things up with. I've been getting by with a +6 Flail I came across, but I'd like something that makes more of a statement. I'll cheer you guys on to whatever it is you're trying to accomplish. If we get a couple more interested players, we could spin up a third team that you could join. The best way to learn is to play, and the best time to learn is the tournament. No experience necessary!